Children see letters all around them without realizing it. By using environmental print that they are familiar with to point out letters, children begin noticing letters they see, and reading words they see. I worked hard to put together this alphabet book of child friendly environmental print. If there are any logos or products you think should be added, please let me know. I know in different areas, there are different stores, etc. I focused on what we have in Michigan. 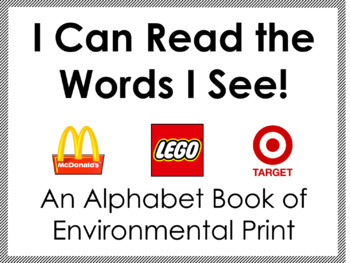 I hope you find this product helpful in teaching your students to read environmental print!